I’m taking a trip down Memory Lane and remembering the late George Delaney who served as Con Edison Vice President for Westchester operations for many years. George was super involved in community life, served on many boards and supported many causes, one of them being the arts. I first met George at a “Sunset Serenade” concert held on the lawn at Lyndhurst and sponsored by Con Ed. What jogged my memory was a notice of an August 3 “Sunset Jazz at Lyndhurst” program for our “Music in the Air” initiative (a directory of free and affordable outdoor arts events throughout the county). The concert is described as one in a series of “live jazz concerts on the sweeping lawns of Lyndhurst Mansion.” Here’s a shout-out to Mark Morganelli of Jazz Forum Arts, Howard Zar of Lyndhurst and NY Presbyterian Hospital for reviving this summer tradition a few summers ago after too long a hiatus. 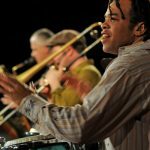 The August 3 concert features Afro-Caribbean rhythms and improvisational jazz provided by acclaimed drummer Willie Martinez and La Familia Sextet. More “Jazz at Sunset” concerts take place each Thursday evening through August 24. Please plug into artsw.org/musicintheair for other free and affordable outdoor concerts. And…don’t forget to bring your blanket.